Following our district’s successful trip to the Haarlem Jamborette as an alternative to the World Scout Jamboree in 2015, we plan to return again in 2019. Please indicate your interest in taking part in this trip using the form below and you will be contacted about forming the leadership team later in the Spring term (2018). Scouts – 7.15 pm for an 8.00 p.m.’ish’ start. 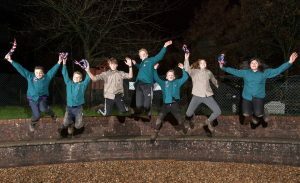 Today we are formally announcing the seven lucky Scouts and Explorers who have been selected to represent Hemel Hempstead at the World Scout Jamboree in West Virginia, USA in 2019! They are: Josh Lee, Ollie Myatt, Becky Harding, Nate Jermy, Timmy Gower, Jen Bishop and Tom Rumble. They are now starting on their long journey of fund-raising and will soon be joining one of the Hertfordshire Units which will represent the UK at the Jamboree. Selection was long and our seven were picked not necessarily for merit, but to support them with confidence building, independence, self-belief and acceptance. We hope you will support their events – you will see them at Bunnings Sausage Sizzles through next year and they will be hosting the District Quiz night on Saturday 24th March 2018. The District Jamboree launch event will be on Wednesday 4th July! Pictures courtesy of John Larkin. Twenty-two of the older scouts from around the District attended a linking event with Explorers last week – great fun was had by all, cooking and eating pancakes, followed by a boisterous game of Dodge Ball! Well done to all scouts who took part in the Green Beret competition last weekend in some challenging weather conditions! Also, a big thank you to the team of Explorers who helped run the bases. Flights have been booked for the District Expedition to Kandersteg 2017, very exciting! The leader team will meet this week to start detailed planning. Two Waters Activity Centre invite you to submit a team of Scouts from your Scout Group to take part in our first competition. It will be held in the Range at the rear of Apsley Scout Hut on 16th October 2016. Start time 12 midday. Teams are to consist of 3 youngsters. There will be an additional individual category for any Group unable to submit a Team. Youngsters are welcome to enter both categories. An Adult responsible for your team must be present on site during the competition. Cost: A nominal charge to cover pellets & targets of £3 per entry, payable on the day. Please book your places by 12th October and return the completed Entry Form by email to the address below. Please see the attached documents about the ever-popular go-karting activity on Wednesday evenings (starting after half term). One letter is for young people to go independently, the other is for those sections who want to make a block booking. Thanks to Sean, Richard and 1st Leverstock Green for running this as always. Please find attached a flyer for the kayaking course for Scouts (aged 10+), taking place on 10th April at the Two Waters Activity Centre (Durrants Hill Road, Apsley). Two Waters Activities Centre is offering Paddle Sport Activity Courses this year for Scouts to work towards the Staged Paddle Sports Activity Badge and the Water Staged Activity Badge. Beginners’ course is aimed for those who have not attended any previous TWA courses. Returners course for those who attended the 2015 Beginners course.